The Huntsman features an extra-high 6'2" door giving convenient access, but still has an overall building height of less than 2.5m to help comply with planning regulations for the best of both worlds. With large glass doors and windows, you'll have a beautifully well-lit interior to spend your time in. The building can also be used for many different purposes. 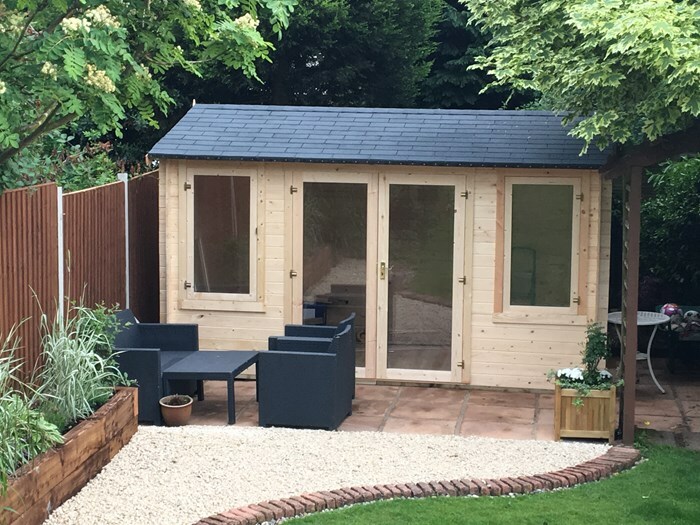 Whether you're in need of an office to work from home in, a hobby and games room for making the most of your free time, or just a comfortable summerhouse to relax in with your family, the Huntsman Log Cabin is perfect for you. The Huntsman lets you customise several important aspects of the construction, letting you get the exact building you want. The Huntsman II can be assembled in different configurations to place the side window in the optimal position for your garden, and we also give you the choice of size, door and window style, glazing style, floor thickness and roof covering to create the ideal solution for your needs. The Huntsman uses interlocking timbers, a traditional building method that gives additional strength to all of the boards. This is a far superior technique to that used for basic panel buildings, firmly fixing the timbers together and using their combined weight to give extra rigidity to the structure. The timber used for the building walls is 19mm tongue and groove, an entry-level log cabin cladding that makes the Huntsman an affordable solution. With walls that are much thicker than the average garden shed, it has a strong and rigid construction so you can look forward to many years of enjoyment. 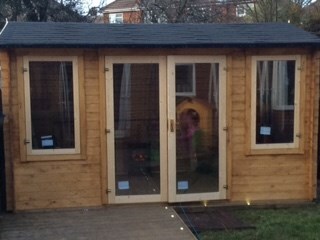 Traditional Style (Georgian bars) – Premium and Standard options: The Traditional Style Huntsman Log Cabin includes Georgian crosses placed upon the doors and windows to give the building a classic English feel. Choose Standard for single-glazed windows that are adequate for a seasonal summer house, or Premium to upgrade to double-glazing that will help keep you warm in the Autumn and Winter months. Tongue and groove roof boards: The roof panels for the Huntsman are constructed from quality tongue and groove timber, just like the rest of the log cabin. This helps to increase the weather resistance of the building as well as its overall longevity, ensuring that it's built to last. Due to its position on the building, the roof is the most exposed and vulnerable to the weather, so it needs protecting as a result. Select one of our great roof weather protection options to ensure that the Huntsman remains water-tight and in great condition from day one. Width 413cm 13'7" 413cm 13'7"
Depth 282cm 9'3" 319.1cm 10'6"
Ridge Height (Inc Floor) 247cm 8'1" 247cm 8'1"
Door Opening Size (w x h) 156cm x 187.6cm 5'1" x 6'2" 156cm x 187.6cm 5'1" x 6'2"
Depth (Internal) 233.4cm 7'8" 263.4cm 8'8"
Window Dimensions 72cm x 125cm 2'4" x 4'1" 72cm x 125cm 2'4" x 4'1"
Front Roof Overhang 93cm 3'1" 93cm 3'1"